That magic moment we wait for every spring has finally arrived, consuming the first salad of the season from our garden. Don’t get me wrong, we eat salad all the time but no supermarket salad can equal five minutes of picking fresh greens from our backyard. Garlic, pak choi and a lot of arugula. Organically grown, without pesticide, crispy, crunchy greens give us great satisfaction. We aren’t just satisfying our palate but our minds as well; a sense of accomplishment arises. When you are able to walk out to your backyard or down to the basement (ginger & kaffir lime leaves) and pick your fresh produce, you can feel a lot closer to the earth. The food seems to taste better. You may think I romanticize this, but it’s true for most people. You feel accomplished because you see the outcome of your work within a short period of time, the product of your labor you actually enjoy eating. You also gain a sense of independence from mega-supermarket chains that otherwise dictate what you should or shouldn’t eat. We cheated a bit on our first dish. I added tomato and bell pepper in it since our tomato and peppers are still little seedlings. It was a great lunch….a fulfilling one too. Fresh shrimp, cooked and peeled. 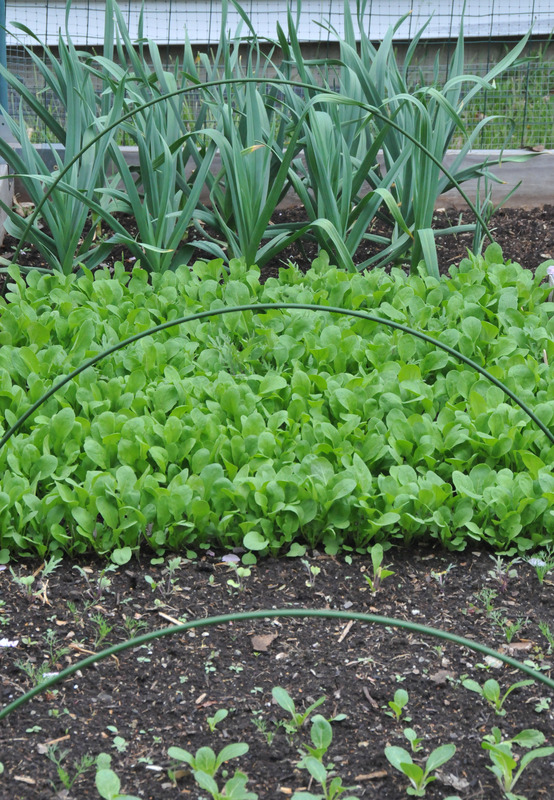 Fresh greens (lettuce, arugula, dill, radish..these are what we have now, but you can use any fresh greens you like). Two mint leaves, finely chopped. Too much mint will fight with the dill. Clean all the vegetables, spin dry, toss. Keep a couple of dill leaves for decoration. Crush garlic and chili pepper in a mortar then transfer the mix to a small bowl (big enough to accommodate the shrimp), add soy sauce and lime juice. Adjust the ingredients to taste. Add cooked shrimp to the sauce, mix them well. Add chopped mint and toss. 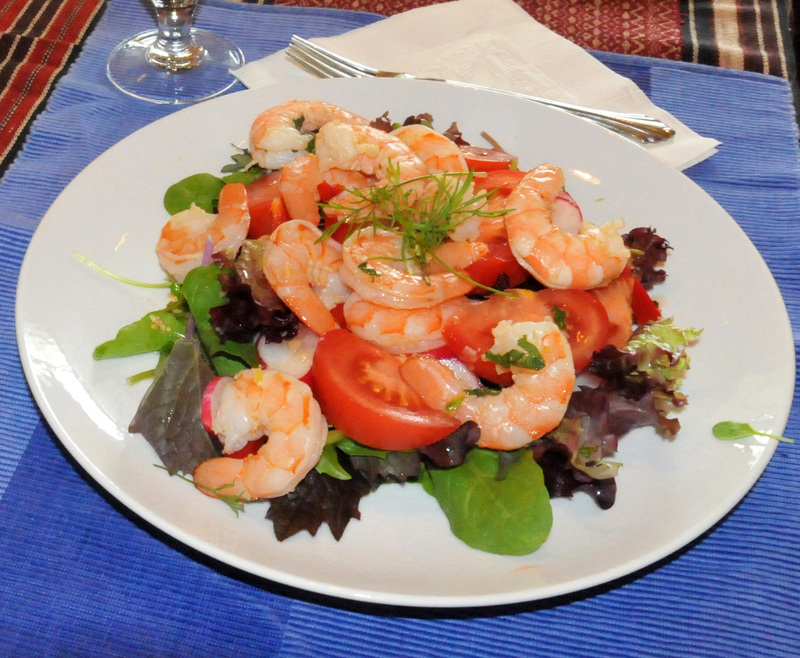 Put salad on the plate, top with the shrimp you just mixed. Decorate with dill. If you have any liquid left in the bowl, pour it over the salad. Done! Great with chilled chardonnay or beer. Bon Appetite!